Dunedin, Florida, like it’s neighboring towns and cities, has an interesting and ethnic history. The earliest inhabitants, like the surrounding territory, were native Americans. It was the later settlers that set the tone for today. In the 1800’s Scottish families settled the area. The name of the town, Dunedin, is also the Gaelic name for Edinburgh (Dùn Èideann) Edinburgh is the capital of Scotland. Two Scotsmen, J.O. Douglas and James Summerville, named the settlement. Douglas, Summerville and others brought their Scottish customs to the area. Marston was a carpenter and citrus farmer. He provided jobs for other settlers who came to the area. Dunedin is the oldest town south of Cedar Key, Florida. It became one of Florida’s chief seaports and trading centers because it had the space to accommodate larger sailing vessels. Dunedin was incorporated as a town in 1899. Residents demanded it due to pigs that were constantly running through town. In order to ban livestock from the town it had to be incorporated as such. In 1913 it became a city. Just before and during World War II, the Food Machinery Corporation had a factory in Dunedin. The factory was the site where the Landing Vehicle Tracked was developed by Donald Roebling and others from Roebling’s alligator. The LTV was used in WWII and training on them was done at the factory. During that time the school and its students were housed in the Hotel Dunedin. This continued until 1944 when the program was transferred to Camp Pendleton in San Diego, California. Today Dunedin is a great area to live and visit. It still celebrates it’s Scottish heritage and history. Come on by and see for yourself. Dunedin, Florida is a great place to live. Whether you are looking for business real estate or for your home, it is a cozy town with amazing character. Here is also some cool information that can help you choose Dunedin. 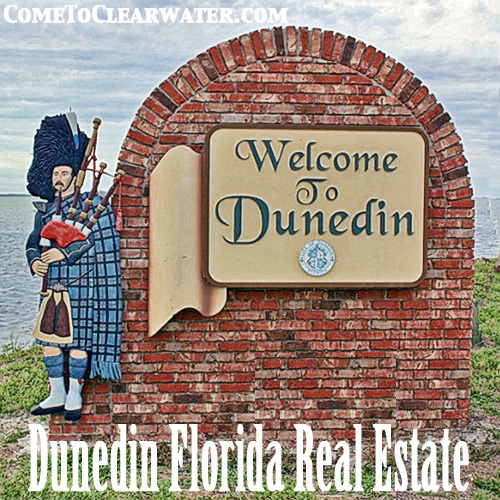 Dunedin is located close to Clearwater Beach, in Pinellas County, Florida. Dunedin’s name comes from the Gaelic pronunciation of Edinburgh, Scotland – NOT Dune-din but Dun-edin. Its heritage is from its early Scottish inhabitants. It has a sister city in Scotland called Stirling. Dunedin honors its Scottish roots yearly with its annual Dunedin Highland Games. Dunedin High School and Dunedin Highland Middle School each have competition-level pipe and drum bands, and the high school marching band is called the Scottish Highlander Band. The city itself has its own pipe and drum corps, made up of teens and adults. If you like the beach, Dunedin has plenty to offer. The Dunedin Causeway, Honeymoon Island, and Caladesi Island State Park, are rated among the best beaches in the world. Dunedin has gone the extra mile to protect the views of its amazing waterfront. In attention to keeping things simple and not take away from the beauty of the nature around Dunedin, the downtown business district has kept large commercial signage absent. If you wanted to do something other than lay on the gorgeous beaches, there is golf and hiking or biking. The Dunedin Country Club golf course is a semi-private golf club that has memberships, but is also open to the public. If you like biking, walking or hiking, the Pinellas Trail runs right through downtown Dunedin. It’s, a 39-mile-long bicycle and pedestrian trail that runs through Pinellas County. Sports are big here too. The Toronto Blue Jays hold spring training here, and it is home to the class-A Dunedin Blue Jays of the Florida State League. Dunedin is also full of whatever size home you may need. From small bungalows to large, roomy homes, you’ll fine whatever your heart desires.